Chris Robinson, a 3D digital design major, is helping to make a classic arcade game that is expected to be released on Xbox One. The collaborative nature of MAGIC Spell Studios gives RIT students such as Chris Robinson the unique opportunity to create, develop and publish digital media projects alongside students and faculty from a variety of colleges and departments. Robinson, a fourth-year 3D digital design major from Philadelphia, has been working with a multidisciplinary team of students on Fragile Equilibrium, a classic arcade game produced by MAGIC Spell Studios and expected to be released on Xbox One later this year. Robinson, the project’s lead artist, is primarily responsible for the overall look and feel and helps develop how players interact with the game’s assets that generate a visual battle between depression and serenity. 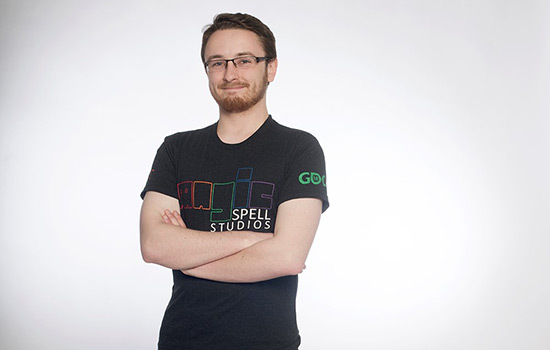 The idea for the game was launched in Professor Andrew Phelps’ class and was further developed by MAGIC Spell. Robinson hopes after graduation to work in the games industry doing character design, with a specialization in 3D imagery and CGI (computer generated imagery). But for now, he’s thrilled with the idea of seeing the game he has worked on in the hands of users everywhere.